If you are looking for a durable, affordable alternative garage or tool shed, consider purchasing the Shelter Logic Barn Style Portable Garage Canopy. The 2" diameter 17 gauge steel frame is put through a 13 step Rhino Shield surface preparation process and finished with a bonded DuPont(tm) thermoset baked on powder-coated finish to ensure that the portable storage unit will maintain structural integrity during adverse weather conditions. 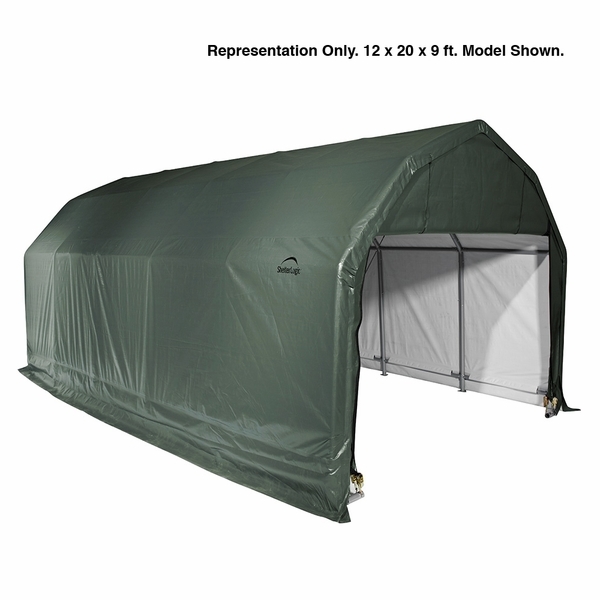 This durable structure is covered with a heat bonded, triple layer, polyethylene, and UV treated inside and out with added fade blockers, anti-aging, anti-fungal agents to keep out rain and unwanted sunlight. The patented Twist-Tite(tm) technology tensioning system and Easy-Slide Cross Rail(tm) system ensure that the structural covering stays taut and locked down tight. You can use this structure confidently as the manufacturer backs the portable garage canopy with a 1 year warranty. 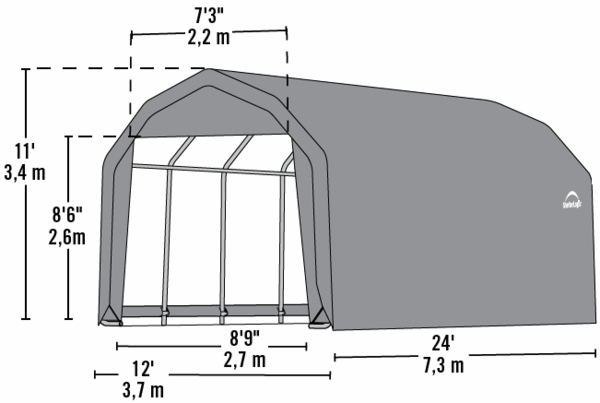 So, for a portable structure with permanent structure benefits, consider purchasing this portable garage canopy! Is the frame is set up for snow loads? That item has not been rated for snow loads. However, you may be interested in the ShelterTube Snow Load Rated Shelter as it has been rated snow loads up to 43 pounds per square foot (when properly anchored). Where can I get the fire safety information for this canopy? There is no fire certification available for this item, as it is not fire rated. Everything was exactly as advertised. There were no surprises and delivery was amazingly fast. I am very pleased. It took 4 1/2 hours for myself and my buddy to set up this 12 x 24 x 11 barn style garage canopy. Heavy duty 2" tube frame and vent to keep airflow moving through this awesome shelter. Common sense and well defined directions is all it took . Now we have the perfect place to store our vintage snowmobile collection.... perfect. Great product. Much more stable and better quality than a COSCO product. Very pleased with the doors and heavy duty zippers. I screwed mine onto 4x4 pressure treated frame, then added the auger anchors for added stability. Also, used 2 pulleys attached to the upper frame, as the pulleys which came with my unit were not very good. Also, I opted for the commercial 21 oz material which added a great deal to the cost. ConsPoor quality plastic pulleys. Took me 2 weeks to put it up. Got this Great product for a good price! It was fairly easy to put together and was delivered fast ! The items is well made and designed to withstand years of weather. The instructions were OK...could use some tweaking in some areas. The metal parts are well made and all parts except one matched up perfectly. Make sure your ground is even. They mentioned "reasonably flat"..no prob with angle of the site, but it all needs to be flat. ProsAll around a VERY sturdy and good looking structure. The green is a very dark color......much better than pictured on the site..and better for blending. I would definitely recommend this product for someone looking for the style. Price was better than the others and shipping was included (the deal winner for Elite). No high cost boat wrapping at end of season for me! ConsThe tent material was rubbed....something you would not notice until you have the skin set up hours after setting up. It was likely caused in shipping..one of the boxes seemed like it had brush burn...possibly put back by the shipper. You'd never know until later. I thought assembly of the canopy was pretty simple. If you read the instructions and watch the video on the Shelter Logic web site made the process easy. Everything was there and the shipment came without any issues. You will definitely need 2 people to assemble this building and 3 would make it much easier. It has been through a couple of big storms so far and have no problems whatsoever. Well worth the price.